Found on a leafy high street in Wandsworth, Ben's Canteen is an inviting looking place with its main restaurant at the back and a bar and a few well spaced out tables at the front. When i arrived there were a few hipsters and locals hanging out in the bar, playing with their macbooks and drinking cocktails respectively. The BC burger contains a slice of corned beef right on top of the patty. Its not that canned corned-beef-hash type stuff as i first thought, but the wet-cured-in-brine type. If you hadn't paid attention to the menu, you might think it was a slice of roast beef. Its a different choice of burger addition, but does it make the BC burger special or just unusual? Well it certainly makes a welcome change to a couple of slices of streaky bacon. 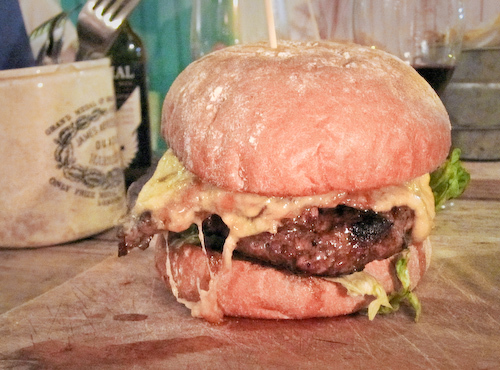 Melted into the top of the corned beef is smoked cheddar which is itself covered in Ben's very cheeky burger sauce. I was worried the extra slice of beef would add a layer of dryness to the top of the burger, but the burger sauce balances everything out perfectly. The patty is excellent, a decent sized piece of medium rare coarsely minced beef. 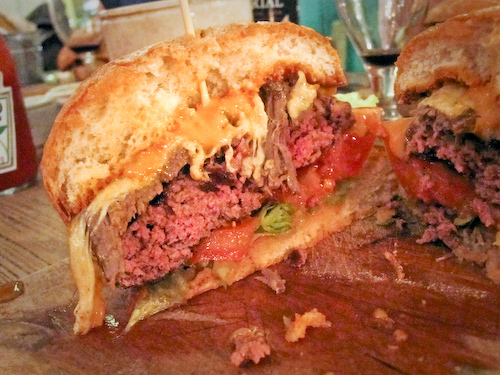 Very juicy with a rich beef flavour, its grin inducing tastiness was apparent at every corner of our table. The chef told me there's a special addition; a mixture of puréed mushrooms, beef stock, salt, pepper and mustard which they reduce, then let cool, before adding to their well aged Black Angus beef mince. 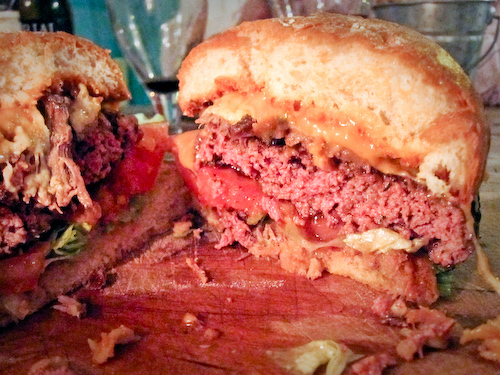 It works a treat, there's a lot of flavour going on in this burger. Its pretty awesome. The whole thing is assembled as follows: Bun, iceberg lettuce, tomato, patty, corned beef, smoked cheddar, burger sauce, bun. 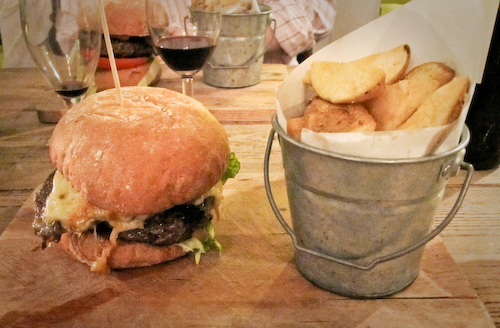 The presentation is great, the burgers arrive on big slabs of wood with mini buckets of very decent potato wedges. There's a good selection of interesting beers and wines available too. 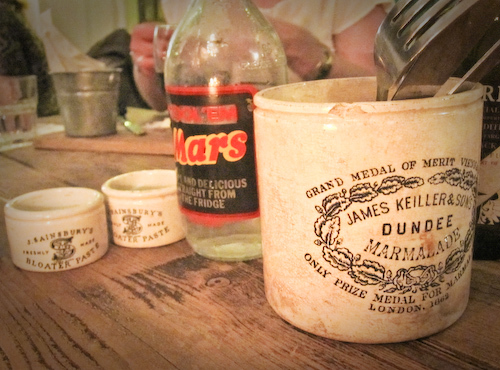 The place has been designed well, with some cool old English touches like old Dundee marmalade pots for cutlery holders and old fashioned milk bottles for table water. Service started off well when it was quiet, at first I wasn't sure if the staff there were just chatty locals. 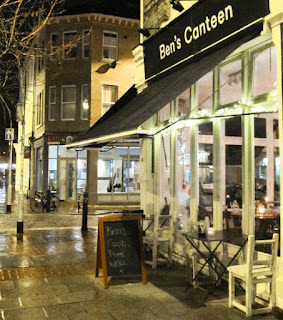 It made for a super relaxed atmosphere which i loved, but later in the evening getting the bill was a bit of a challenge. Ben says a lot of thought has gone into this burger and i believe it. They have even made a video of the burger creation process. If i lived closer i'd visit regularly. I bet its a great Sunday morning coffee, papers and wifi type hangout too. BC Burger: 12.5 - Homemade Black Angus Patty. Homemade Corned Beef, Smoked Cheddar with Ben’s Burger Sauce. Served with Hand Cut Chips.